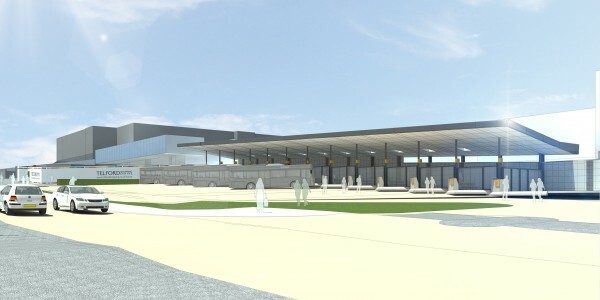 A planning application for the redevelopment of Telford’s Bus Station has been submitted to Telford & Wrekin Council. In drawing up the latest plans, the shopping centre responded to public feedback on previous proposals to redevelop the Bus Station in another part of the town centre. As a result, there was widespread support from visitors to the exhibition to modernise the facility while keeping it in the same place, with a weather-protected route into the shopping centre. The planning application also includes exciting proposals for redevelopment in this part of the shopping centre, including larger stores, a new landmark entrance from Northfield Street and a new mall within the centre to connect New Street and Sherwood Square. The Bus Station plans have been prepared in close partnership with Telford & Wrekin Council as well as Arriva Midlands & Shires, in order to meet the bus operator’s need for modern facilities and also encourage increased public transport use by creating a better environment for customers. A £1.3m contribution towards the cost of redeveloping the Bus Station itself is being secured by Telford & Wrekin Council from the Marches Local Enterprise Partnership. A decision on the plans is expected before the end of the year and, if approved, the new Bus Station could be complete by the Autumn of 2017. The programme has been designed to ensure that there is no need to relocate services during construction and that disruption is kept to a minimum. The new Bus Station is part of the multi-million pound redevelopment that is transforming Telford Shopping Centre with new shops, cafés and restaurants. Construction of the first part of the masterplan – the Southern Quarter – started earlier this year (2016). The development’s steel frame is shooting up next door to Southwater, with TGI Friday’s, Prezzo and Handmade Burger Company already signed up to open restaurants here when it opens in Spring 2017. The redevelopment of the Northern Quarter, on the site of the former ASDA store, is also underway. “The new Bus Station will provide modern facilities and a much more welcoming environment for our customers arriving in Telford by bus. Halogen is appointed by the owners of the shopping centre to manage communications for the multi-million pound redevelopment of the scheme. Prior to submission of the plans Halogen undertook a public engagement programme to support the planning application, including managing the public exhibition.